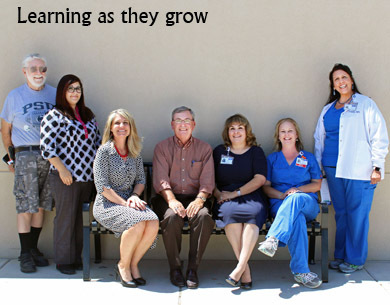 Artesia General Hospital employees who have received money to further their education from the Artesia General Hospital Fund pose for a picture Tuesday morning at AGH. Pictured from left are Joe Schiel, scholarship coordinator, Geneva Lugo, who is attending Western Texas College, Tracy Smith, attending the University of Texas at Arlington, Gary Sims, Special Hospital District board member, Karen Mercer, attending National American University, Brandi Ford, attending New Mexico State University, and Patty Bartock, attending Grand Canyon University. Not pictured is Cory Yates, attending Lubbock Christian University. “This is a 501(c)(3) nonprofit organization that the community can contribute to,” said Schiel. “Navajo has been our biggest supporter over the years, and we’ve appreciated their help.” Anyone interested in donating may mail checks made payable to Artesia General Hospital Fund to 502 W. Cordova Road, Ste. 1, Santa Fe, N.M., 87505.